Little Italy, sometimes referred to as College Street West, is a district in Toronto, Ontario, Canada. It is known for its Italian Canadian restaurants and businesses. There is also a significant Latin-Canadian and Portuguese-Canadian community in the area. The district is centred on a restaurant/bar/shopping strip along College Street, centred at the intersection of College and Grace Streets and the adjacent residential area, but spreading out between Ossington Avenue and Dufferin Street. The exact borders of the district are imprecise. The area south of College to Dundas Street is almost always considered part of Little Italy. The area north of Harbord Street is known as Palmerston–Little Italy or Bickford Park. The Royal Cinema is a theatre that was opened in 1939. College Street was fully laid out in the area by 1900 and the area was filled with buildings from the early 1900s. College Street is fronted by two- and three-storey buildings, with commercial uses on the ground floor and residential or storage uses on the upper floors. From Manning Avenue to the east to Shaw Street to the west, there are numerous sidewalk cafes, including Cafe Diplomatico, Bitondos Pizza, Bar Italia, Riviera Bakery, and Sicilian Ice Cream. Two nightclubs have opened on the block between Shaw and Crawford, and there is a small plaza and supermarket on the south side of College between Shaw and Crawford Street. The curved street between Grace and Crawford was laid out with larger sidewalks. This section was laid out at a later date to cross Garrison Creek, which was eventually buried under Crawford. The wider sidewalks have allowed more extensive cafe patios in this area. A tourist attraction of the area is the Italian Walk of Fame. Granite and brass stars line the sidewalk with the names of noteworthy Italian Canadians. At Clinton Street, on the north side, is the Royal Cinema, which was recently renovated and has an upgraded projection system as it is used for movie editing purposes during the day and repertory cinema in the evenings. While the commercial units are dominated by cafes and restaurants, there are numerous other small businesses serving the neighbourhood. Bay and gable homes in Little Italy, mostly built in the early 1900s. Although the character of the neighbourhood is still Italian with several Italian restaurants and bakeries still present, the demographics of this neighbourhood have changed drastically with a smaller Italian population than originally. 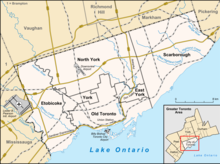 Much of the Italian population has moved to the suburbs of Toronto, in particular Woodbridge. Street sign in Little Italy typically include colours of the Italian flag. A statue of Johnny Lombardi, who launched Canada's first multicultural radio station in 1966 from Little Italy. The first multicultural radio station in Canada was CHIN, launched in 1966 by Johnny Lombardi, and aired from studios on the south side of College between Grace and Clinton, on the second floor of Lombardi's supermarket at 637 College Street. Lombardi first purchased airtime on English radio stations before establishing the Italian-language CHIN Radio. The studio, much expanded, is now located at 622 College Street, and the section of the street has been officially nicknamed Johnny Lombardi Way by the City of Toronto; a historical plaque is installed on the southwest corner of College and Grace Street. Lombardi died in 2002 and CHIN is now run by his son, broadcasting in 30 languages. Toronto District School Board (TDSB) operates English-language secular public schools. The school board operates a elementary as well as a secondary school in the area. Opened in 1916, Central Toronto Academy is a public, semestered secondary school operated by TDBS. It is located on Shaw Street. Central Toronto Academy is a public secondary school in Little Italy. Dewson Street Junior Public School is a public elementary school, located at 65 Concord Avenue, near the intersection of Ossington Avenue and College Street. The school was first built in 1884 with an enrollment of 76 students. The original building consisted of a basement and four rooms on two floors. It was built on land that was formerly part of the Village of Dovercourt, annexed to the City in 1910. In 1965, the Board of Education decided to replace the old building, which, after a series of additions, consisted of 23 classrooms, 4 kindergartens, playrooms and offices. In September 1968 a new three-storey school building was constructed. A new playground opened in the fall of 2002. Television and film productions are occasionally filmed in the neighbourhood. Movies filmed nearby include Chloe, Police Academy, Scott Pilgrim vs. the World, The F Word, and The Long Kiss Goodnight. In December 2013 and 2014 the TV series Beauty & the Beast decorated the corner of College St. and Markham St. with a New York City Subway entrance, emergency vehicles, and newspaper stands. A 2018 romantic comedy titled Little Italy takes place in Toronto’s Little Italy. The film was also featured on an episode of How Did This Get Made?. De Kerck, Denis; Paina, Corrado, eds. (2006). College Street, Little Italy: Toronto's Renaissance Strip. Toronto, Ontario: Mansfield Press. ISBN 1-894469-27-5. ^ "The littlest Little Italy slowly fades away". theglobeandmail.com. 26 August 2005. ^ "Awesome Movies Filmed in Toronto". Archived from the original on 2015-08-06. Retrieved 2015-01-26. ^ Matthew Burpee. "We're now in New York City". Retrieved 2013-12-12. Wikimedia Commons has media related to Little Italy, Toronto.